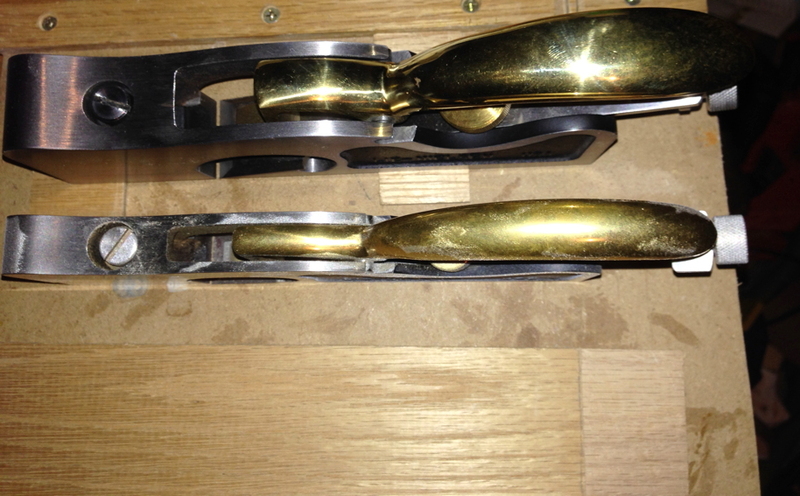 This month we’ll take a look at Lie-Nielsen’s Large Shoulder Plane (073). This is the largest of their shoulder planes and weighs in at 4 lbs. The body of the 073 is made from durable Ductile Iron and measures 8-¼” long by 1-¼” wide. The body is ground very precisely so that each of the two reference sides is exactly square to the sole, as is necessary to create the standard shoulder to tenon relationship. The A2 Tool Steel blade is cryogenically treated, double tempered and is .140” thick and .005” wider than the body, so you can set the plane up with the blade slightly proud on both sides. 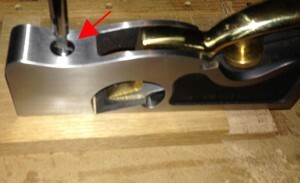 This allows you to make lateral adjustments without the blade becoming inset on one side. If it is necessary for a specific cut, you can always register the blade flush on one side, but in general it is best to be proud on both. The blade comes with a 25 degree bevel and its bedding angle is 18 degrees. The lever cap is Bronze and along with providing both a good grip and additional mass, it is absolute eye candy. Even though there is significant difference in size between the three planes in this series, the operation and features are the same for each. As a quick note, since I wrote about the sharpening and setup aspect of shoulder planes in another article earlier this year, I won’t bother including it in this article, too. There is one aspect of the sharpening portion that I’d like to update. 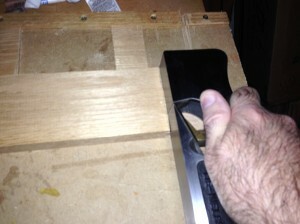 While I still use my Kell sharpening guide presently, I plan to upgrade to Lie-Nielsen’s forthcoming sharpening guide. It is solidly and accurately made and can handle a wider range of blades than any I currently own. The size and mass of the 073 are significant and beneficial. Years ago I purchased a Lie-Nielsen Medium Shoulder Plane, at that time thinking it would give me the best of both world’s (small and large). I would now opt for the Large Shoulder Plane if I were obtaining only one for my shop, as I find the mass helps the plane continue through the cut, once started. It also acts as if it wants to stay connected to the reference surface, but even if it does shift slightly, I think the feedback it provides is more obvious. The Large (in the back) vs the Medium shoulder planes. Irons for the Medium (in the back) vs the Large shoulder planes. 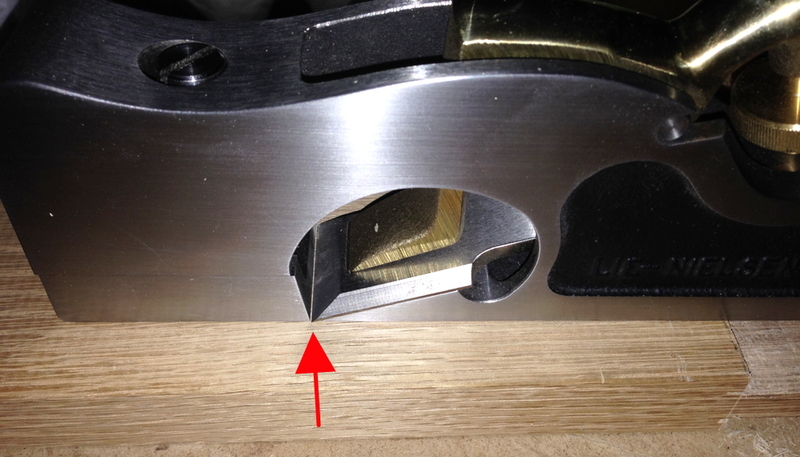 The shoulder plane can obviously address shoulders on tenons, create or increase the depth of rabbets, and both remove and clean up additional material from a dado, just to name a few operations. Depending on the operation, you may wish to have a nice tight mouth while taking a very fine shaving, or more readily remove a fair amount of wood and open the mouth for the thicker shaving. Shoulder on tenon, after using the Large Shoulder Plane. **Note, the score line I made was so light that the pencil wouldn’t stay within, so don’t misread that portion of the photo. It is extremely easy to adjust the “shoe” of the plane, which controls the mouth opening. The first step is to loosen the screw on top of the front section of the plane by turning it counter-clockwise by about half of a turn. Red arrow indicates the screw to unlock the shoe. 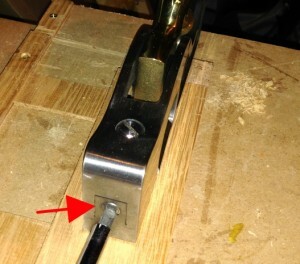 Red arrow indicates the adjustment screw location. After loosening the shoe locking screw, turn the shoe adjustment screw on the toe of the plane to move the shoe. 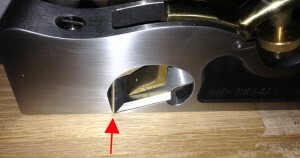 Turning this screw clockwise will bring the shoe towards the blade, closing the mouth opening. Turning the screw counter-clockwise will open the mouth. When closing the mouth, pay close attention to the blade, so you don’t accidentally hit it with the shoe. You don’t want to dull or damage the blade. Red arrow points to the mouth set to a somewhat neutral position, but large enough for most shavings. Mouth is set much more tight than the photo above when working with a very fine shaving. After setting the mouth to the desired opening, make sure to re-lock the shoe by turning the screw on top of the plane clockwise until snug. To limit any damage to the locking screw head, either use a Lie-Nielsen #4 screwdriver that fits the head precisely, or any other screwdriver with correct tip width and length so there is no slop. For optimum results, make sure you keep the plane iron shaving sharp. I also like to apply a little paraffin to the bearing surface(s) (sole and potentially the side, too) to reduce the friction, which I find allows for better accuracy since less force is required through the cut. and you may just find it superseding its predecessor. There is just no way around it; this is one sweet plane! I hope you enjoyed the article and please let me know if you have any questions or comments. CLICK HERE to find out more information or to purchase the Lie-Nielsen Large Shoulder Plane (073). I would agree 100% with your assessment. I used to have the medium, but I sold it to upgrade to the large. The large can do anything the medium can do, but the reverse can not be said. In fact, the extra mass makes many shoulder plane tasks even easier. The link about shoulder plane sharpening takes me to http://blog.woodworkingtooltips.com/2013/02/get-woodworking-week-tips-for-getting-started-from-lee-laird/ ???? Hello. Thank you for the comment. The link takes you to an article from 2013, where Lee briefly discusses the set-up and sharpening of your plane and iron. Lee clearly says he wrote something earlier this year specifically on shoulder planes not back in 2013? Mr. Crowe, we apologize for our mistake, and thank you for bringing it to our attention – the link has been updated to the correct article. Please let us know if we can be of any further assistance!